As the Torah is the written law of Judaism, the Talmud is the oral law of Judaism, written down. Talmud Bavli, commonly called the Babylonian Talmud, is a monument of rabbinic literature from around 70 A.D. until the Muslim conquest of the Holy Land at the beginning of the seventh century. Falvey has added to its print collection Talmud Bavli; the Schottenstein daf yomi edition. 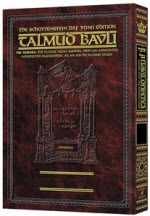 This edition of Talmud Bavli is located in the Falvey West stacks, call number: BM499.5 .E5 2000. The Encyclopaedia Judaica (2007) identifies the publisher, ArtScroll, as having “embarked on large-scale translation projects that have had little precedent (and not much success) among other English-language Judaica publishers, such as the case of their widely acclaimed, 73-volume Schottenstein Talmud (completed in 2005), which involved a remarkable array of sponsors, translators, and talmudic authorities from both within and outside the ḥaredi [that is the ultra-Orthodox Jewish] world” (Stolow, Jeremy. “Artscroll.” Encyclopaedia Judaica. Ed. Michael Berenbaum and Fred Skolnik. 2nd ed. Vol. 2. Detroit: Macmillan Reference USA, 2007. 534-535. Gale Virtual Reference Library. Web. 4 Sep. 2012. ).